It’s Just a quick one today as I have been so busy finishing off the studio in order for me to get on with creating real life content for you. Today I wanted to talk about working with what you have and consistency. You may have noticed the Para European Dressage Championships taking place this week. I love watching the Para Dressage as it always make me challenge my beliefs about how we need to use our bodies in order to communicate effectively with our horse. There were riders competing with various “problems” including riding with no legs! What these riders all do is work with that they DO have and use that to the best of their ability. They look for alternative ways to get the job done. Secondly they are consistent. Realistically your horse has been trained to respond to certain aids but he doesn’t know if these are the same aids other horses understand does he? 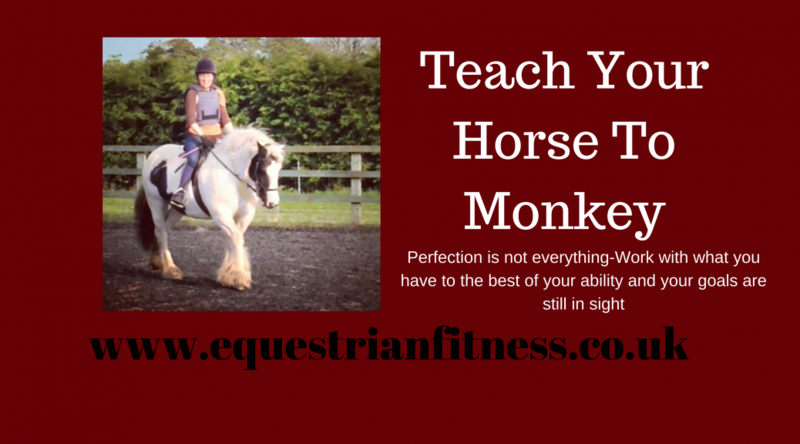 If you really wanted you could train your horse to trot by saying monkey and each time he gets it right you reward him and eventually he will understand that monkey means trot! So if you really can’t get your leg exactly where you need it to be, if you consistently give aids with your leg where it will go eventually your horse will learn to respond. This doesn’t give you an excuse to not try and improve yourself as I have already said it is about making use of what you have got; and with that comes making what you do have be the absolute best it can be. Continue to work on that hollow back or wobbly hands etc. but don’t beat yourself and think that you can’t ever achieve your goals it will just take hard work and consistent training. You work hard to improve your horse as an athlete and you should therefore work to improve yourself as an athlete but just remember even the best of the best have their problems they just don’t let them get in the way-Usian Bolt has Scoliosis and he’s the fastest man in the world! I have just got back from a weekend at BHS Camp at Aintree Racecourse where I spent the weekend working with a lovely bunch of ladies. One of the things I did was look at Rider position and alignment. The starting point of this is always the pelvis, and more specifically the seat bones. The Seat bones are one of our main communication tools when we ride. Your horse knows where they are, he knows if they are moving or if they are still and if one is sat somewhere different than the other. Your instructor may sometimes ask if you can feel your seat bones and I bet many of you give a kind of nod not really knowing if you can or you can’t. Or you may be able to feel them but they aren’t level and you don’t know what to do about it. First things first let’s find your seat bones. There are a couple of ways you can do this. Most simply you can just sit on a firm chair and sit on your hands, and you should be able to feel a bony lump in each cheek (yes even through any extra padding…..). Another great way is using small, spiky physio balls. Just pop one under your bum and have a roll around. If this feels a little uncomfortable you may be inhibited in you glutes which will in turn affect your riding and I would suggest spending a little more time using a ball in this way to release them. 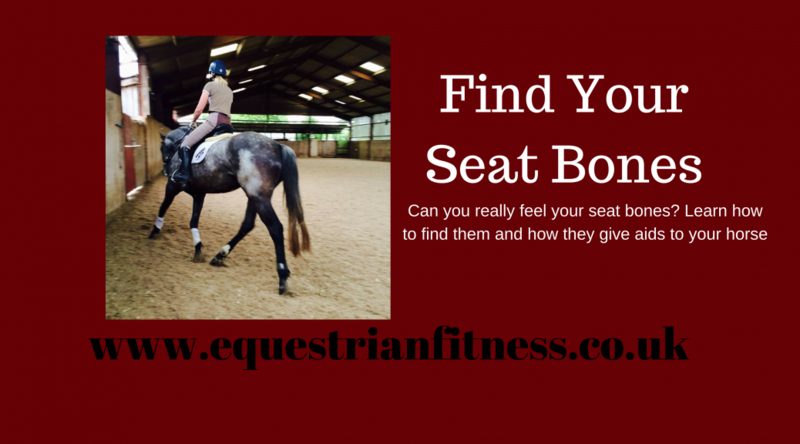 You can also try riding (if you have a bombproof horse!) with the physio balls under your seat bones and see how this affects your position in the saddle. If you find you lift a seat bone on corners and circles this will help you to stay level as you will be trying to keep the ball in place. If you are un-level in your seat bones a gym ball should become your new chair of choice. Just sitting on the ball and lifting your feet will help you to get the feel of a level seat. Obviously if you aren’t level you won’t be able to lift both feet! Feel free to hold onto something solid to help you get your balance first that way you can feel which way you need to shift your balance to find your central point. Just doing this alone has improved my position and balance in the saddle. Once you have found your seat bones try this little challenge to show you how much your seat bones affect your aids. In walk feel your seat bones move forward and back in time with your horse, now try to slow your seat bones down and then make them still. What does your horse do? If you did it right he will have hopefully slowed down or stopped completely-clever pony! I’d love to know how you get on with these exercises, either hit reply or tag Equestrian Fitness on Social Media! 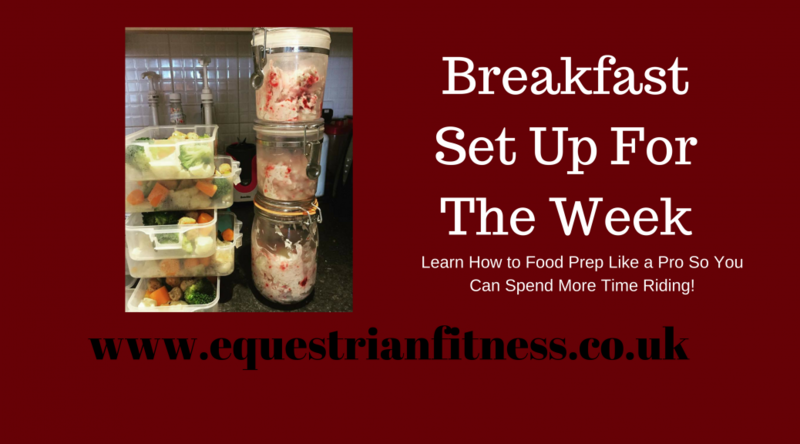 Hopefully after last week you have a healthy breakfast ready to go all week. So now we are going to move onto lunch. To be honest I keep my lunches pretty simple but there are loads of options you could do that you could either keep fresh in the fridge all week or freeze to get out the evening before to defrost. I love to just have Chicken Sausages (www.heckfood.co.uk) with some veg such as broccoli, carrots and cauliflower. The key to stopping them going mushy is to only boil them for a couple of minutes so they are still pretty crunchy. To pimp them up I sometimes add spices such as Paprika, Turmeric, Cumin and Chilli or I use a pre mixed selection of herbs. You could make a huge Spanish omelette (Eggs, Peppers, Onions, Mushrooms, New Potatoes, maybe add some ham or chorizo) cut it into decent slices and just add fresh salad each day (you can buy pre bagged I won’t tell). If you are up for doing some actual proper cooking you could make a lean turkey or beef chilli style dish by light frying it with whatever vegetables you like (things like peppers, onions and courgette work well) add tinned tomatoes and some paprika and/or chilli, and maybe some kidney, butter or adzuki beans or butter nut squash. This should keep in the fridge but you could also freeze it in portions and just take it out the night before. If you add fewer tomatoes so it is not really in a sauce this would be tasty eaten cold but if you happen to have access to a microwave it would only take a few minutes to heat up. This could also be easily made into a stir fry, or cook some of your favourite veg and add to rice or pasta and add a spice mix or marinade. Perhaps you could batch cook some strips of chicken, beef or pork with a Piri Piri marinade, make a bean salad (you can buy mixed beans in tins and just add other veg if you like such as carrots, peppers, celery, onions) and mix together to either eat on its own or with a wrap or pitta. It’s not really the weather right now but Soup is really easy to make in bulk, portion out and you can either heat up that morning and keep in a flask until lunch or heat up at work if you have facilities. Just add yourself a bread roll and it will make a really filling lunch. Covent Garden do some great recipe books with some really simple but tasty options as well as some more adventurous. 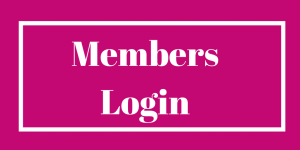 Pinterest also has some great ideas for meal prep recipes, there are literally hundreds so it really boils down to what you like to eat and how much cooking you want to do, but taking just a little time on Sunday to prepare for the week will not only help you to make healthier choices it will also save you time during the week and save you money! 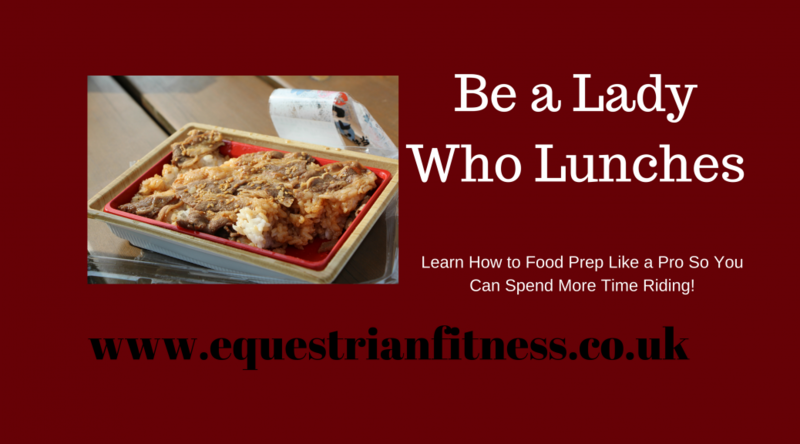 I’d love you to share your own meal prep ideas with me! A post I did about food prep got a lot of interest last week and I was asked for more details on what sort of food I eat that I can prepare on a Sunday and still have fresh from the fridge on Friday. I’ll be honest I eat fairly simply, but that doesn’t mean it can’t be tasty or that you couldn’t make up your own versions. I’m going to start with Breakfast so you have a week to up your breakfast game before adding in lunch. I either make Overnight Oats or Granola, Yoghurt and Fruit. They are both pretty similar to be honest but you can play around with the recipes to make different flavour combinations so that it doesn’t become boring. Roughly 400ml milk depending on consistency. Just add oats, yoghurt and fruit together and mix whilst adding the milk to get it to required consistency. I like mine quite thick and gooey some prefer it more liquid. Either put it all in a jar/tub and leave in the fridge & portion out when you need it or if you have the space (and the Tupperware) portion it out into pots ready to go. Other combinations could be - banana and cocoa powder or frozen dark cherries and cocoa. Basically just use the formula of oats, yoghurt in whatever flavour, any milk and add things to it! Sometimes I add chia seeds and a shot of coffee to chocolate and cherry oats. The Granola is pretty much the same system except its just granola, yoghurt and frozen fruit without the milk. I’ve been using blueberry and mango or apple and raspberry but again you can experiment with whatever you like. I also only buy plain oats, nothing fancy at all, supermarket own brand is fine. As with the Granola I actually find a really tasty one in B &M that is just oats and chocolate chips. I find the cheaper granolas actually have less sugars etc. added but whatever you like to read the ingredients list and try to get one without sugar added if you can. Porridge-You can buy it in pre-done pots and sachets you just add water to so you can eat it at the yard or your desk. Or you could make a smoothie with just some milk, a banana and other fruit (frozen is fine as long as your blender is strong enough!) and maybe add some peanut butter or protein powder to make it more filling. Again the flavour options are endless. I like Chocolate protein powder, almond milk, banana, and mixed berries or Chocolate, peanut butter and a shot of coffee. As long as you have a plan in the morning these need only take minutes to put together. So, make a plan now, make a shopping list and spend just half an hour of Sunday making healthy breakfasts for the entire week!